That is all, please go about your business normally, nothing to see, nothing to worry about. Please do not fret about the bloody great dragon flying around the place nuking whole zones. Cataclysm, where should I log out? Stormwind, use the new Inn in the back of the dwarven district, this is going to be the new hub, there’s a breadcrumb board, close to the “Island of Portals” and once you have old world flying you’ll never need to go near the front of SW again. Ironforge, close to the action but not the major lag hub Stormwind is going to be. Two choices, Stormwind at the Dwarven district end, or the Exodar (low populatation, low lag). Wherever makes sense for levelling. Travel is far far less painful than it was. Of course the bottom line is “whever you think makes sense for your playing”, but personally I’m going to be moving my tankadin at the weekend to Stormwind (only a short ride back to his favourite inn at Ironforge) ready for the push against Deathwing. All I can say is that it’s a dream. The quest flow is smooth, controlled, the amount of meaningless travel back and forth is gone, the addition of the new flightpoints improves travel massively. Rather than running / riding between two points and having to give 100% attention to the game “just in case” I have a couple of minutes to focus outside of the game or just look at the scenery. 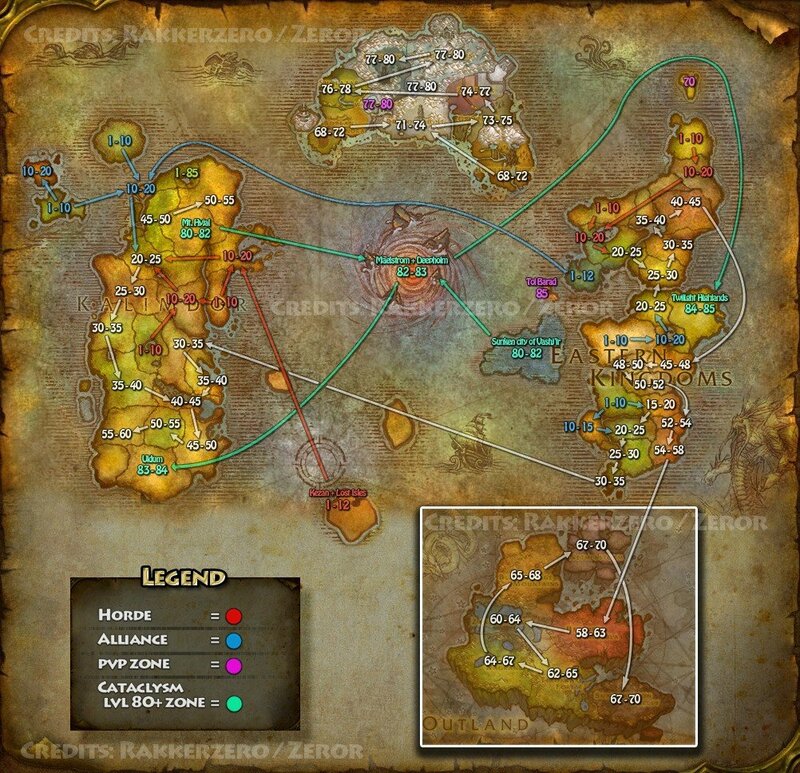 MMO-Champion has linked to a nice image which shows the flow of levelling through from the starter areas, and it feels “right”, currently my Shaman (level 40) is running what I will loosely call the “Dwarf” / “Eastern Kingdoms, North” quest route (Loch Modan / Wetlands / Plaguelands), the major upshot of which is I now have to level a horde alt to Andorhal so I can see their side of that storyline. Damn you Blizzard. For the new player the quests are telling a consistent story of the world following the remodelling done by our new arch enemy, for the player who’s seen this all before we get to see the changes, spot NPCs in new locations / roles and watch the slightly daft RP at the Menethil docks by the crew of a ship which hasn’t moved since launch which has now sunk. So roll up something new and get out there and look around. ﻿I read dear_gnome, reasonable quality rants and a reminder that in general my realm is one of the better ones out there in the EU. A lower level of moronic behaviour and reasonably nice people, the same is true for most of the battlegroup. However since 4.0.3a has dropped I have noticed what I can only describe as “asshattery” from a certain portion of the level 80 community. Rushing around the low level zones, blasting past the sub-20 nuking everything in their path, one-shotting the quest mob and then pelting away again. Leaving the player levelling their new toon standing there with “wtf” floating around above their heads. There are many players working loremaster since the reset in 4.0.3a who are perfectly reasonable, nuking things in a different part of the sub-zone to the levelling player, inviting them into a group for the named mob kill and so on. This discussion is not aimed at them, they understand that WoW is a co-operative enterprise and I salute all of the players who remember that behind the alts running around there are people who’s enjoyment of the game is just as important as theirs. So let’s look at some of the reasoning and justification for those who wish to quest in zones well below their level. I can understand this, when Cataclysm drops in just over a week everyone is going to be focusing on levelling and then gearing for the new content. Are you so special that your ‘rights’ override everyone else’s? I hear you, however most players have been complaining about being bored with ICC for 3-6 months, and you decide to go do Loremaster this week? True, but distinctly anti-social, treat others as you would be treated yourself. This is firstly assuming that the player levelling through the zones doesn’t have an 80 (as my posts elsewhere on this blog testify I have a number of 80’s, I want to be trying something new), it also has a certain level of arrogance that the only focus for the game is to blast through to the cap as quickly as possible and gear for raiding. There are other aspects to the game. It also fails to account for players, of which there will be a lot signing up at the moment, who have only just started playing the game ahead of Cataclysm because of the increased level of advertising. What is the impact on the low level player, surely the overgeared capped player is in and out before they can blink. This is a common tactic (I’ve used it myself in the past, where it’s not going to affect other players), certainly in the whole of the old world there is nothing which is even a risk to a geared level 80, so rounding up a big pile of quest mobs, blowing them to dust, looting and moving on is efficient. It of course means there is little or nothing left for the low level who’s stuck standing there while the slaughter happens. With the added side effect for some quests that all the mobs respawn at roughly the same time and are a significant pain in the arse to deal with. Respawn timers, there’s little more annoying (and this is true where there are players of the right level in the zone as well) than someone else rolling in while you’re fighting your way to a named, killing it and departing before you can even type “invite please”. This is the old favourite for griefing, drag a stack of mobs through an area not caring if they aggro en-mass onto a poor low level and turn them into a puddle on the ground. The other factor which is particularly true at the moment is what happened this week, that’s right Mr Grumpy left his rather run down home in the elemental planes, broke though the world and did a bit of remodelling around the place. Didn’t ask permission from anyone and has generally turned everything upside down. Including which races can do what. As of the middle of the week a whole range of new options opened up, gnome priests, dwarf shammies, tauren paladins (I really must roll a cowadin at some point) and so on. The starting zones on Wednesday were seething with fresh shammies on my realm, a significant proportion of these will have then pushed out into the wider world, wanting to see the changed levelling experience, maybe get that class they’ve failed to learn so far beyond level 10 and so on. Simply the zones are busy with ‘levelling traffic’ at the moment, they’re not the empty zones they were on Monday before the aforementioned dragon decided to step out to grab a paper, wreck the world and do some remodelling. I know for some people I’m preaching to the choir, to others I’m just whining about the nasty level 80’s and so on. However I admit to being a carebear and through a pile of life experience know that not being a selfish arse just looking out for No. 1 generally makes for a nicer life all round. So I can only leave you with the following words of wisdom. “Be excellent to each other” – Bill S. Preston, Esq. A little background, I’m definitely a PvE player, on a PvE / RP server in the EU. I do go toe to toe with the horde face mashing but I want it to be broadly on my terms. Standing in the middle of my attacks on a quest mob trying to get me to flag myself, it’s not cool. In the same way challenging me to a duel and then spamming me with /w about how I’m “chicken” or a “noob” because “only noobs refuse to duel”. Here’s the thing, there are times when I want to go up against a real live opponent, and there are times (which is the bulk of my play time) when I want to be questing, or in a dungeon / raid or even bumming around working on some OCD triggered achievement. While PvPKiddie may get off on 100% face to face combat, I don’t. Generally these types are either twinked to the max or decked out in resiliance gear, so I know I’m going to get my arse kicked with no real challenge. What most of these people want is an easy kill so they can crow about how awesome they are. Guys, this is only fun for you. That is the problem. The same applies for coming into a capital city, you want to come in blast through the place, kick Varian in the teeth. Actually can someone please do that, though if you come to see Magni then I’ll be there mace at the ready to say “hi”. That’s cool, you’re going for our bosses, however glitching the system to get up out of range of the melee on your mage and camping the AH. Where the hell is the challenge in that, where’s the honour? There’s a good summary of portal manners over at “You yank it you tank it”, as ever it comes down to “treat other people as you wish to be treated yourself”, of course if you are an anti-social loon who likes being sworn at then “be excellent to other people” should cover it. I shall be spending very little time on my mage for the next few weeks except when I’m slacking and actively touting for business as a taxi.